Think Flannery O’Connor riffing Elmore Leonard and you get some sense of this wildly inventive, picturesque novel that stretches the boundaries of what is means to be family and what it costs to love and be loved. But don’t get me wrong. J.C. Sasser writes in her own lyrical style, weaving often tragicomic events into a mosaic of sometimes hallucinogenic wonder. Sixteen-year-old Gradle Bird has lived her entire life with her Grandpa, Leonard, at a seedy motel and truck stop off Georgia’s I-16. But when Leonard moves her to a crumbling old house rumored to be haunted by the ghost of Ms. Annalee Spivey, Gradle is plunged into a lush, magical world much stranger and more dangerous than from the one she came. Here she meets Sonny Joe Stitch, a Siamese fighting fish connoisseur overdosed on testosterone, a crippled, Bible-thumping hobo named Ceif “Tadpole” Walker, and the only true friend she will ever know, a schizophrenic genius, music-man, and professional dumpster-diver, D-5 Delvis Miles. As Gradle falls deeper into Delvis’s imaginary and fantastical world, unsettling dangers lurk, and when surfaced Gradle discovers unforeseen depths in herself and the people she loves the most. 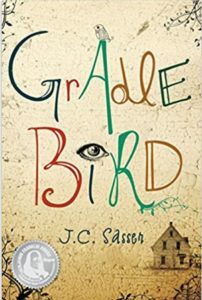 Gradle Bird is an unusual tale of self-discovery and redemption that explores the infirmities of fatherly love, the complexities of human cruelty, and the consequences of guilt, proving they are possible to overcome no matter how dark and horrible the cause. Anyone who doesn’t fall in love with Gradle Bird, the character, might want to stop by an Urgent Care facility for an EKG. Anyone not totally mesmerized by the world depicted in Gradle Bird, the novel, might as well forfeit his or her Human Being ID card. J.C. Sasser’s invented a complex, big-hearted, dirt-road-smart protagonist surrounded by hilarious one-of-a-kind characters (and a ghost). Absurd, yet utterly believable. Southern, yet universal. I’m jealous. Gradle Bird is available from the following booksellers. Support your local independent bookstore by purchasing from Indie Bound (the red icon).